Oluwayimika (Yinka) Taiwo-Peters, Angie Gonzalez, Mallory Smith, and Kaila Squires, all first-year MBA students from the Wharton School of Business, have won the 2019 Executive Leadership Council‘s National Business Case Competition. As a team, they will share a check for $35,000. 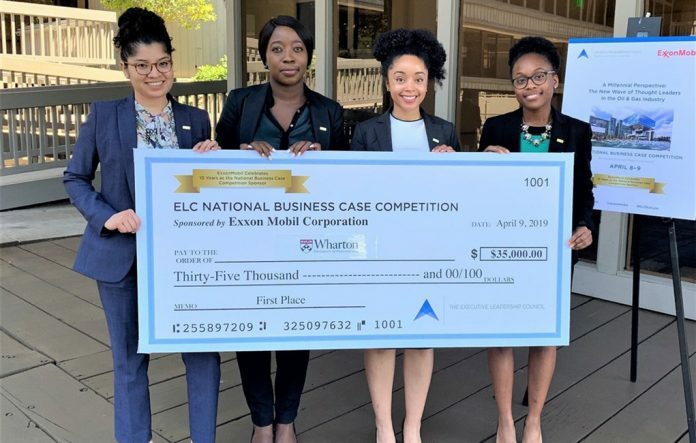 The annual competition, sponsored and hosted by Exxon Mobil Corporation for the tenth consecutive year, invites students from the nation’s top business schools to form teams, led by Black team leaders, to analyze a timely business issue that demonstrates the students’ critical thinking, analytical and communications skills. The teams were challenged to research and identify factors, roadblocks, and other impediments to industry image, brand, recruitment and retention. The teams developed and presented viable solutions for attracting and retaining millennial/Generation Z employees. In addition to the cash award, the first-place team from Wharton will be introduced at The Executive Leadership Council’s Annual Recognition Gala on October 10, 2019, at the Marriott Marquis in Washington, DC, attended by more than 2,200 leaders in business, public affairs, education and the arts.